Every 11 years, the sun undergoes a furious upheaval. Dark sunspots burst forth from beneath the sun's surface. Explosions as powerful as a billion atomic bombs spark intense flares of high-energy radiation. Clouds of gas big enough to swallow planets break away and billow into space. It's a flamboyant display of stellar power. So why can't we see any of it? Almost none of the drama of Solar Maximum is visible to the human eye. Look at the sun in the noontime sky and—ho-hum—it's the same old bland ball of light. "The problem is, human eyes are tuned to the wrong wavelength," explains Tom Woods, a solar physicist at the University of Colorado in Boulder. "If you want to get a good look at solar activity, you need to look in the EUV." EUV is short for "extreme ultraviolet," a high-energy form of ultraviolet radiation with wavelengths between 1 and 120 nanometers. EUV photons are much more energetic and dangerous than the ordinary UV rays that cause sunburns. Fortunately for humans, Earth's atmosphere blocks solar EUV; otherwise a day at the beach could be fatal. When the sun is active, solar EUV emissions can rise and fall by factors of hundreds to thousands in just a matter of minutes. These surges heat Earth's upper atmosphere, puffing it up and increasing the air friction, or "drag," on satellites. EUV photons also break apart atoms and molecules, creating a layer of ions in the upper atmosphere that can severely disturb radio signals. 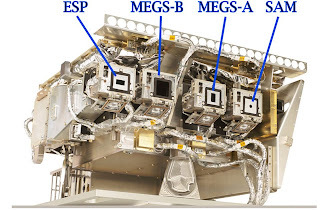 To monitor these energetic photons, NASA is going to launch a sensor named "EVE," short for EUV Variability Experiment, onboard the Solar Dynamics Observatory this winter. "EVE gives us the highest time resolution and the highest spectral resolution that we've ever had for measuring the sun, and we'll have it 24/7," says Woods, the lead scientist for EVE. "This is a huge improvement over past missions." Although EVE is designed to study solar activity, its first order of business is to study solar inactivity. SDO is going to launch during the deepest solar minimum in almost 100 years. Sunspots, flares and CMEs are at a low ebb. That's okay with Woods. He considers solar minimum just as interesting as solar maximum. "Solar minimum is a quiet time when we can establish a baseline for evaluating long-term trends," he explains. "All stars are variable at some level, and the sun is no exception. We want to compare the sun's brightness now to its brightness during previous minima and ask: is the sun getting brighter or dimmer?" The answer seems to be dimmer. 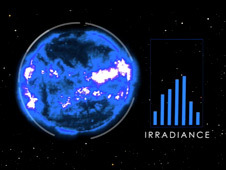 Measurements by a variety of spacecraft indicate a 12-year lessening of the sun's "irradiance" by about 0.02% at visible wavelengths and 6% at EUV wavelengths. These results, which compare the solar minimum of 2008-09 to the previous minimum of 1996, are still very preliminary. EVE will improve confidence in the trend by pinning down the EUV spectrum with unprecedented accuracy. The sun's variability and its potential for future changes are not fully understood—hence the need for EVE. "The EUV portion of the sun's spectrum is what changes most during a solar cycle," says Woods, "and that is the part of the spectrum we will be observing." Woods gazes out his office window at the Colorado sun. It looks the same as usual. EVE, he knows, will have a different story to tell.